Exercise performed on a treadmill can benefit your health either helping to acquire optimal weight, toning lean muscles or by providing a great cardiovascular workout in general. Cardiovascular exercise such as walking, jogging or running can all be performed on a treadmill in the privacy of your own home. You must take care to not injure yourself when choosing to work out on a treadmill, they are not toys they are exercise equipment and can cause harm if not used correctly. Whether this is your first time on a treadmill or your millionth time you need to observe safety precautions to prevent injury. Familiarize yourself with the features of your treadmill before you begin. Keep your eyes focused in front of you and not on your feet. Center yourself in the middle of the belt to prevent falls. Always begin with a normal walking pace to help warm up and get familiar with the treadmill pace. 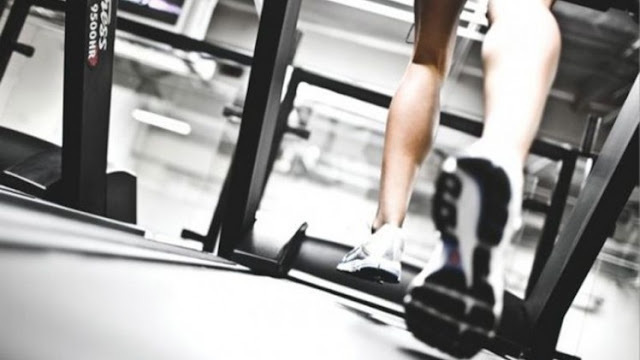 Many treadmills are able to provide you with a slope to walk on, which intensifies your workout. While this may seem like it is providing you with additional workout benefits, it is also increasing the danger of the treadmill. According to Consumer Reports, prolonged walking on a slope overworks the ligaments that are located in the arch of the foot. This condition can lead to many health issues in the legs and the feet. Therefore, you should alternate workouts where you are walking flat, and where you are walking on a slope. Before jumping on the treadmill you should stretch your muscles to prevent injury. Perform a few stretches aimed at warming up the muscles of your legs, back and arms. Once you have stretched start your treadmill at a normal slow walking pace. Walk at this pace for about 5 minutes to finish warming up your muscles. During your warm up phase this is a good time to practice working on the treadmill without holding the railing. When you are just beginning to use the treadmill be careful to avoid over exertion which can lead to falls and injuries. Aside from the general rules of warming up before you start your treadmill workout, there are other safety precautions that you must adhere to if you are to remain uninjured. Live Strong suggests wearing the proper footwear and other workout attire. They also suggest keeping children and pets out of the area where the treadmill will be used. When walking or running on a treadmill, you should always keep your eyes forward. Do not look to the side, or at your feet. At Treadmill Talk, it is suggested that when you stop the machinery that you use the emergency stop feature so that the machine comes to an immediate and complete stop. This should be used even when an emergency does not exist if you need to stop the treadmill. Additionally, you should never jump off of the moving treadmill for any reason – use the emergency stop feature instead. If you find that you are holding onto the front rail of the machine for balance, this generally means that the speed of the treadmill is too great and you need to slow it down. You should hold onto the side rails for balance – not the front rail. Treadmill work out takes time to build up to a nice run, but don’t give up. Start with walking about 2 to 3 times each week for 20 minutes a day. This 20 minutes should include about 5 minutes for warming up your muscles and stretching, 10 minutes of walking at an increased pace and another 5 minutes of slowing down to cool the muscles down. After a few weeks you may try increasing the brisk walking portion of your work out to 15 minutes or longer. As you get accustomed to the walk on the treadmill you can begin to increase the speed at which you walk developing your walk into a jog. You can alternate walking with jogging by walking 4 minutes and then jogging for 1 minute and then repeat. As you improve you may want to use the incline feature of your treadmill for added resistance with your walk, jog or run. According to a report by MSNBC, there were 1500 reports of workout injuries obtained in gyms last year. That number was generated from data collected by the Federal Consumer Products Safety Commission. Most of these incidents were from people flying off of treadmills. Most of those accidents happen because people are trying to increase their speed on the treadmills before they are actually physically able to keep up.